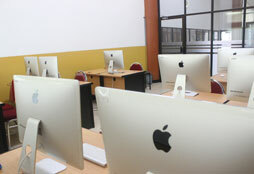 STIKI Malang Computer Center has the main facilities in the form of five laboratories complete with LANs connected to the internet and LCDs in each laboratory equipped with air conditioners to maintain temperature. Borrowing several electronic devices as well as lockers to store bags or belongings belonging to students as well as priting kites is a facility provided by PUSKOM. PUSKOM also builds Hotspot services for all campus areas, so that all students can use a 24-hour hotspot non-stop.